Join the discussion on our forums! Come discuss Small-Time Recruits over in our dedicated Small-Time Recruits discussion topic. Now we know why they wear tiny watches. This card has potential in the future but right now it is for fun gimmick decks. Here is all the possible cards is card can draw from your deck. I can see using one in smorc paladin. You run 1-mana charge minions, buff them with mass +1/+1, and go face. This one translates into 3 charge minions straight in right deck. This card brings back to me memories of a few older Magic: The Gathering cards. Those cards were really, really broken. This card makes me afraid. Very afraid. Blizzard: You know how we tried to destroy aggressive decks in WotOG. Us: Yes and you failed horribly. Blizzard: So we have a great new idea. We will create a card so fundamentally broken that it will make Zooladin beat out Secret paladin for the most bs aggressive deck of all time. Yet, good 1-cost are not so many. Argent Squire, Selfless Hero, maybe Meanstreet Marshal and Abusive Sergeant. That's 8 target cards. Now, your average mulligan will get you 1-2 targets for first turns, maybe you draw some more in the next turns, which means that by turn 3 you already depleted a good chunk of targets. Also, as aggro paladin you do not want to waste an early turn to run this, you want to do so as late as possible, which translates practically into an increased chance to draw targets normally, before using the spell. And using this spell to draw less than 3 targets is quite bad. All in all, the card looks very powerful for aggro, but it's clunky. I'd say it can hardly be useful in more than one copy per deck. Drawing three 1 mana minions for 3 mana is actually a pretty solid effect. Aggro Paladin with likely be playing Argent Squire, Selfless Hero, Meanstreet Marshall, and probably 1 more 1-drop. Many one drops also have 1 Health, giving this card good synergy with Steward of Darkshire as well. It should be fairly strong. However, it has to compete with Divine Favor, which means that if we start seeing more aggressive decks, Small-Time Recruits will see more play, but when we don't it will be replaced by Divine Favor. Some people seem to be hating on this card, but what they don't realize is that it makes your deck smaller by 4!. Two of these makes your deck alot smaller, and you can more reliably draw comboes or finishers. If this card was given to hunter, it would create a super cancerous meta. The only card buffed by Steward of Darkshire is Grimscale Oracle; The minions have to have one health. 1-drops you haven't drawn yet by turn 3. Eh, seems like you're already on the losing side in that case, unless this is some kind of weird deck that runs like 20 1-drops. Several things, Ached Teacher. 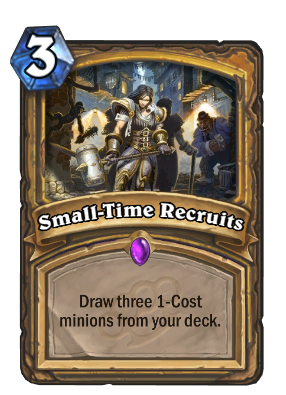 First of all, getting full value out of Small-Time Recruits only demands that you have 3 1-drops in your deck when you cast it; you don't have to run "20 1-drops", especially if you plan to cast it on Turn 3. Second, I've seen Steward of Darkshire and other Aggro Paladin decks that do fill close to half their deck with 1-drops, and perform surprisingly well. Selfless Hero, Argent Squire, Abusive Sergeant, Arcane Anomaly, Young Priestess, and Leper Gnome are perfectly viable in a deck centered around 1-cost minions. Third, if you've already drawn most of your 1 drops prior to casting Small Time, chances are you're already winning on board and don't require the extra card draw; Small-Time improves the consistency of your deck when you don't get an ideal opening hand. No current aggro decks don't trade before turn 4 or so, so actually you're wrong. Looks like good card for Hobgoblin pally in wild.